I love all my blog peeps and I have more than five, way more than five, but I decided to play along and share some of my new faves. *1 Kristybee…the blog. I was so excited to see that she started a blog, I am a huge fan of her photography and I knew she would be a great blogger. You will have to check her out. 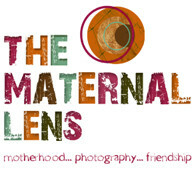 *2 Maternal Lens This blog is a collaboration of five women who are mothers, photographers, and bloggers. They select a photo of the day and have random giveaways, it is really a fun blog. *3 elle moss has to be one of my top 10 photographers of all time and I just discovered she has a blog! Where have I been???? She has another blog, diary of a mod housewife. *4 Kat Braman Photography, I have been a fan of her work for awhile now and I love her blog. It is fairly new but she has been around flickr for awhile. *5 Paper Cameras I recently found this blog and I love the photography and she shares some of her finds with her readers. I am fairly new to this blog and I am already smitten. Awesome blogs! Thanks for sharing them! I’ve got some new reading to do! thanks so much, leaca for including the maternal lens on your list!! i know we are all huge fans of you, too! thanks again for your support! @ Eva Thanks. I love new reads too. @Shannon Yes, post the award and 5 blogs you like. i always end up finding some brand new faves! !